Yat Ming is in on the woody action with this 1948 Ford. Real wood paneling, surf stickers on the rear windows and a roof rack with a wooden longboard really sell the look. 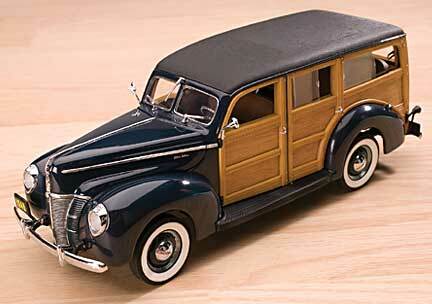 Danbury Mints gorgeous 1940 Ford Deluxe Station Wagon shows how the model originally appeared on the showroom floor. Two rows of removable seats, sliding side windows and spectacular engine precision make this the most detailed version of the most familiar woody body style. In popular lore, Fords Model A Depot Hack was the first surfer woody. True or not, it makes for a cool legend. This restored Hack is still in use today at Fords Greenwich Village near Dearborn, MI. Danburys newest woody is one of the oldestthe 1931 Ford Model A Station Wagon. It features exquisite wire wheels, fine-grain real wood inlay and an interior that is exact down to the springs on the undersides of the removable seats. The side curtain windows are removable, if you prefer an open-air feel. Woodies were associated with leisurely beach life from day one. 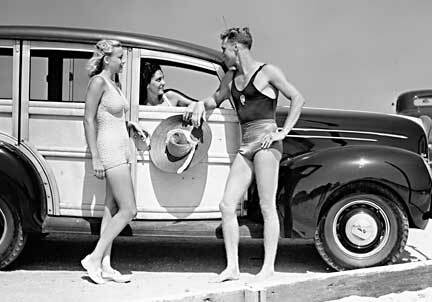 This scene depicts a 38 Ford in its element decades before the surf scene got rolling. Few will dispute that the beach lifestyle is largely centered on Southern California. For decades, music has been written about it, and movies shown worldwide have spread the culture to every corner of the globe. The sun, sand and surf made Frankie and “Annette” household names. 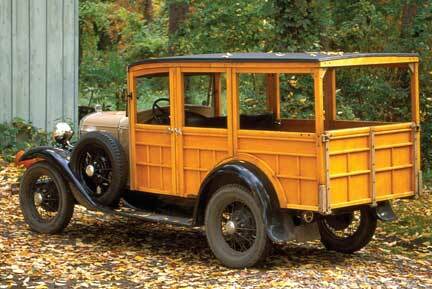 Wood had been a material of automotive exteriors from day one. Some of the worlds most prestigious cars had driver/passenger bodies fashioned from wood. Others, such as Fords Depot Hacks, were strictly utilitarian vehicles used to transport luggage (and sometimes people) to and from train stations to resorts and hotels. 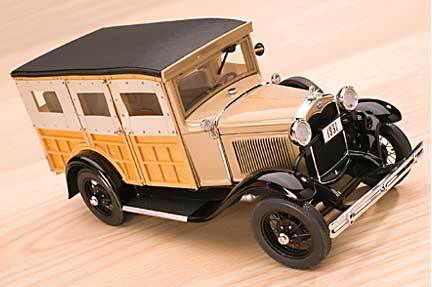 In the 1960s, Revell Model Co. offered a 1:24-scale plastic model of a 1931 Ford Depot Hack Woody with a surf scene package. The depiction was not far from the reality of the day. The basic woody wagon had become an undesirable and often neglected form of cheap transportationperfect for serious surfers living the beach lifestyle. The 1934 Ford woody wagon could be called the first SUV. For $660 (nearly 27 percent more expensive than a standard sedan), these nine-passenger wagons were the stylish way to move larger families. Nearly every manufacturer offered wooden-body vehicles, and most were the highest-priced models of their respected lines. During World War II and for a few years after, steel was in short supply, and partial wooden-body vehicles were as necessary as they were stylish. So popular were woodies that Ford owned its own forest near a coach-crafting plant in Iron Mountain, MI, where the wood bodies were made. As a new era in styling evolved, wood became less and less practical. The splendor of maple, birch and mahogany was gone as manufacturers switched to molded plywood or abandoned the idea of wooden bodies all together. By 1953, only Ford still made a wooden body, and it used wood-like mate-rial; real wood had vanished from production. Woodies became popular surfer sleds when owners, because of the high maintenance of wood, began to sell off or abandon the vehicles in favor of more durable, modern body styles. Surfers, never known for their vast supply of cash, saw the old woody wagons as cheap ways to carry massive boards and still have room for a few boarding buddies. By the early 1960s, surf culture was becoming the coolest youth activity in California, Hawaii and Florida. 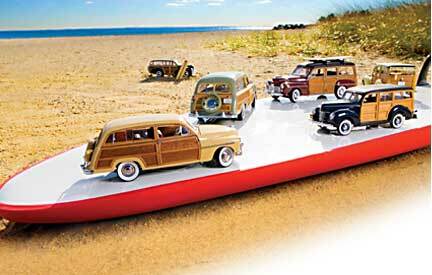 Old woodies were a dime-a-dozen and became not only the ideal vehicle for the wave riders but also a status symbol of the beach set. 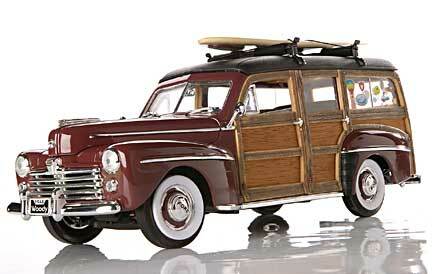 Today, woodies are highly coveted not just by old surfers but also by car collectors and restorers. 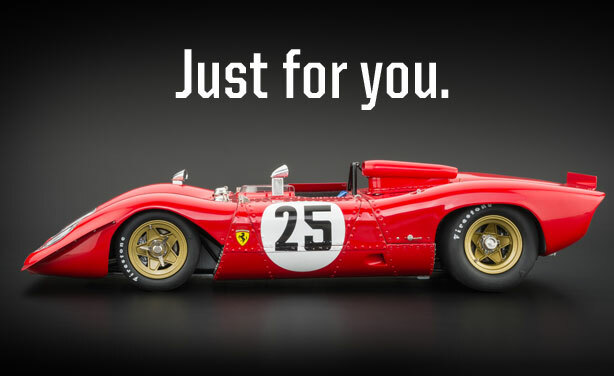 No longer cheap, a sizable investment is necessary to purchase and/or restore such a vehicle. Still, they are as much an icon of the surfer lifestyle as bushy blond hair, longboards, dark blue Vans shoes and white pocket T-shirts worn under ripped Pendletons.